Thread contact material PTFE and stainless steel 14404 only. Usable with medium pressure lamps. 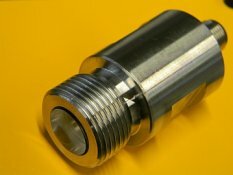 The sensor UV-Water-G3/4 is a water proof (10 bar or 150 psi) UV sensor for use in pressurised water systems (G3/4’’ thread). This UV sensor is suitable for use in food and beverage machinery. Available calibrated (NIST or PTB traceable) on request.